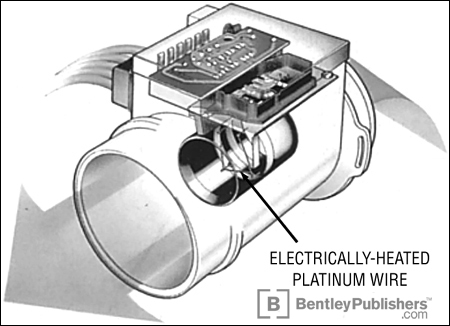 hot wire A method of measuring the air inducted into a fuel-injected gasoline engine. A thin wire across the air intake is heated to a constant temperature by electrical current. Any change in airflow (such as when the driver pushes the accelerator down or releases it) tends to change the wire's temperature; the control system immediately corrects the temperature back to its constant value. The current required to maintain that constant value is the indicator of airflow and thus the system's basic operating signal.